Okay, so I wasn't very good at lazer tag. However last night's bowling turned out to be a great success (for me that is). 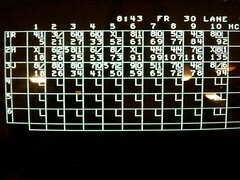 Now I wouldn't go far as to say that I'm a great bowler, but I did in fact win and I was better at it than lazer tag. Also, I would like to say for the record, that although there was bumpers up, I did not in fact hit them or use them in any way, so my win (and score) was totally legit. Below is a picture of the score board for proof. We didn't just randomly decide to go bowling. Our Starbucks store went to celebrate a good customer review score and have some team bonding time. Josh and I were on a alley with my manager, Rebecca. We had a fun time and it was nice to introduce Josh to all my new co-worker friends. What can I say, just another fun Sunday night with Heather and Josh (and I'll admit it...winning did have some factor in making it more fun than not - wink wink).